Gee jack, I could see me sitting there having a quiet ale (or two) Lovely setting. Very, very nice..... I love the strong colours and the beautiful seat....all very balanced with the foliage. 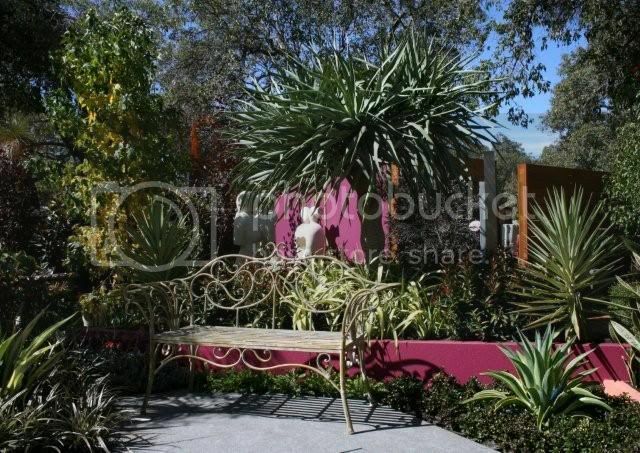 I love the contrast of the traditional seat in contrast with the funky plants and colour. with paint, if you put a wall etc in a egg plant ie slightly dark purple colour then according to my training at horticulture school that this colour is perfect to hide a fence and also was taught to paint walls in bright colours like pink to attract people to the area. have a deep blue fence on two sides of my property and a yellow fence on other side, so will put up some purple and pink fences to create some outdoor rooms.